The Story - Where are the Teachers of Color? Long Island is notoriously known for being one of the most segregated suburbs in the nation. But there’s one part of the story that has been largely untold: The absence of minority teachers in Long Island public schools. W ayne White’s African-American students admire his dreadlocks – the same color and coarseness as their own. Rosa Amador-Cortes’s Latino students are stunned when they learn that Amador-Cortes, a speech language pathologist, speaks Spanish, too. And Niketa Bhatia remembers a little Indian girl, a second or third-grader with a caramel-colored complexion like her own. “Are you Indian?” she asked Bhatia, a substitute teacher. Yes, Bhatia said. The child smiled. White, Amador-Cortes and Bhatia are all teachers of color – black, Latina and South Asian. But on Long Island, the cultural connections they share with same-race students are scarce. Their numbers – their very presence – are marginal, compared with the students they teach. During the 2015-2016 school year, 35 percent of public school students on Long Island were black or Latino. But only seven percent of teachers were black or Latino, according to statistics from a recent study. And that’s a problem, dozens of Long Islander educators say. The children of color lose role models – the rest are deprived of diversity. In interviews, more than two dozen teachers, administrators, experts and students spoke about the need for more diverse teachers, the impact of their absence on students from all backgrounds and how Long Island school districts are trying to change the current numbers. Last fall, The Education Trust-New York released a report based on unpublished state data. The group, a nonprofit organization that promotes educational equity for students in New York State, laid figures bare from the 2015-2016 school year. On Long Island, more than one third of white students in public schools never get to see teachers of color, 35 percent attending a school with not one black or Latino teacher. Meanwhile, 19 percent of Latino students attended a public school with no same-ethnicity teacher, and 18 percent of black students attended a school with no same-race teacher. Long Island is home to 125 public school districts. Only 18 of those districts had a teaching staff that was more than 10 percent black or Latino. And only one district’s teaching staff – Hempstead – was more than 50 percent black or Latino. Compared with the entire country, Long Island has a deeper diversity gap. More than 88 percent of Long Island’s kindergarten through 12th grade teachers are white; the remaining 12 percent are black, Latino or Asian, according to the latest census data. That’s six percentage points above the national average. When students are deprived of teachers who share their skin tone and heritage, they lose a special bond, says Abja Midha, Deputy Director of The Education Trust-New York – the connection of shared life experiences and empathy. Like Quentin Thomson, a 19-year-old African American who grew up in Suffolk County. 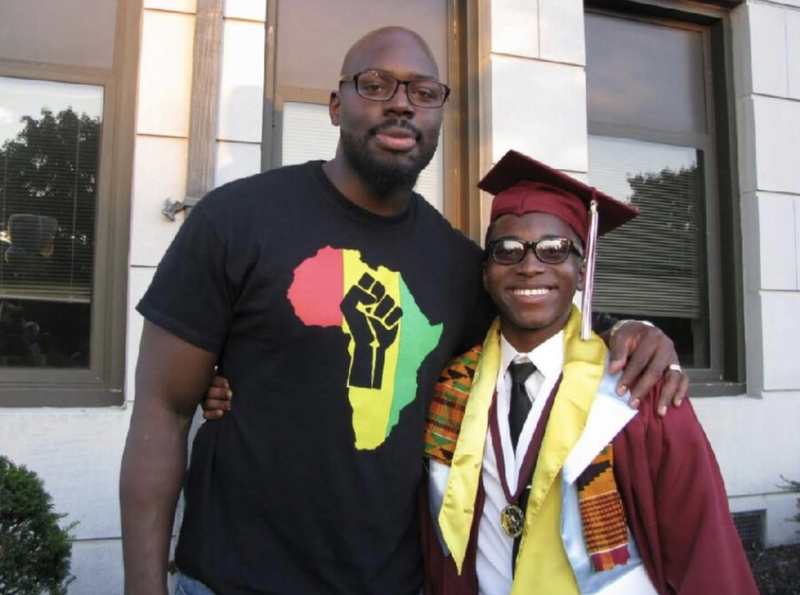 When a white classmate used the N-word in an offensive nature in front of him, Thomson said, he sought a black teacher for advice – Aaron Johnson, a global history and African-American studies teacher at Bay Shore High School. “I thought he would be the best resource for me to go to, in terms of dealing with that, because he was one of the few black male teachers in the school,” said Thomson. Sixty-one percent of the district’s students were black and Latino from 2015-2016. Only 12 percent of the teachers were the same. Aaron Johnson and Quentin Thomson celebrate on Thomson’s high school graduation day. “Because I grew up in a black neighborhood, all of their new words and lingo and colloquialism is natural to me,” Johnson said. “It’s organic. I speak their speak.” Photo courtesy of Quentin Thomson. Johnson taught him how to toughen his skin and deal with similar slurs, Thomson said. And when Thomson enrolled in Johnson’s semester-long African-American studies course, he also learned about the etymology behind the N-word – the roots of the racial slur and the power of the word in the past. Competent teachers of color bring “insight into the lives of racial/ethnic minority students and the experience of living in a racist and ethnocentric society,” writes Ana Maria Villegas in a 2010 literature review that cites over 80 academic sources. That gives them an advantage over their white colleagues, argues Villegas, an education professor and past researcher with the Division of Education Policy Research of Educational Testing Service. But minority students aren’t the only ones who can benefit from exposure to teachers of color, educators say. Especially “white kids” who are training to become teachers – kids like Brandy Scott’s college students from the early 2000s. White kids from lily-white backgrounds – they’re from here, their parents are from here, they never left Long Island. It’s so important that they see. Scott, the President of the Long Island Black Educators Association and an educator for over 30 years, recalled running a survey for a class at Dowling College, a private Long Island liberal arts college that closed in 2016. Some students told her she was their first teacher of color. Scott pauses, and then slowly exhales. “Some of them were actually uncomfortable.” One or two admitted the truth aloud, while others expressed their emotions with their body language, Scott said. — Brandy Scott, President of the Long Island Black Educators Association. Photo by Taylor Ha. Soon after the survey, Scott urged her English teachers-in-training to read books with characters of color, to critique books that omitted those central characters, to consider how children would respond to books they could not culturally relate to. 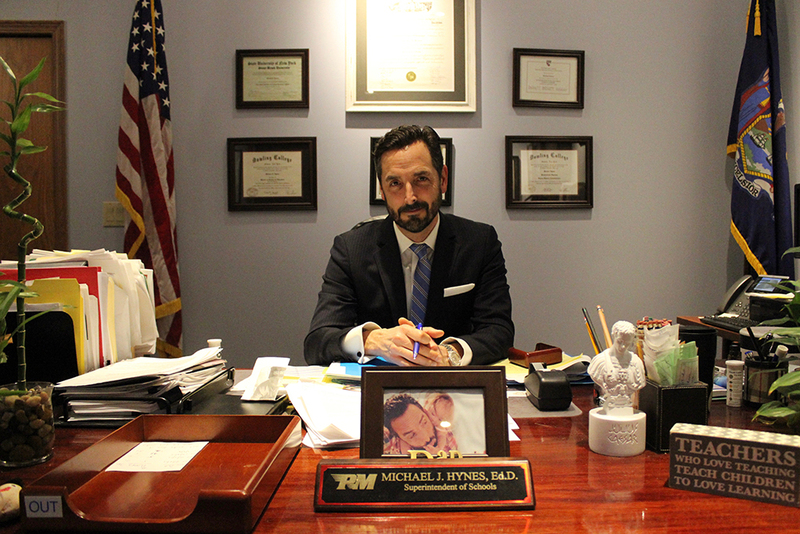 Michael J. Hynes, Superintendent of Schools at Patchogue-Medford, was another white child raised in a bubble. His was Sayville, a Long Island school district whose student population from 2015-2016 was seven percent black or Latino. Its minority teaching staff population was even smaller – less than one percent. When he left his hometown for college in West Virginia, he met strangers from across the world – students from West Africa, South America, Europe. — Michael J. Hynes, Superintendent of Schools at Patchogue-Medford. Photo by Taylor Ha. Recent studies, including a 2016 study from NYU’s Steinhardt School of Culture, Education, and Human Development, show that minority and non-minority students psychologically benefit from having a minority teacher. Researchers analyzed 30-question surveys filled out by students around the country. The students evaluated 1,700 middle and high school teachers from more than 300 schools. The researchers ultimately found that all the students, regardless of their ethnicity, possessed more positive perceptions towards teachers of color compared to white teachers. Educators and experts attribute a myriad of reasons behind the shortage of minority teachers, including implicit bias, the absence of explicit district policies that ensure teacher diversity and hiring through connections, which favors white Long Islanders. But the most common answer was, simply, a lack of applicants. You have stacks of resumes in the hundreds that you have to sift through, so how do you choose who you want to interview? It is difficult to gauge how many blacks and Latinos are applying for teaching positions on Long Island. Hiring committees are legally forbidden from asking applicants about their race. And because of the sheer number of applications, said White, President of the Bellport Teachers Association and a New York State United Teachers Director at Large, the selection process is usually based on whom you know. “You have stacks of resumes in the hundreds that you have to sift through, so how do you choose who you want to interview?” said White, who is African American. Since the majority of Long Island is overwhelmingly white, you’ll end up with more white candidates. And once black and Latinos land teaching jobs on Long Island, he continued, it’s not always easy to keep them in the classroom. Earlier in his career, colleagues and administrators once expected him to be the “disciplinarian” who could control the rowdy black students. White, who has taught social studies at South Country for nearly 20 years, said it got so bad that he contemplated moving to Atlanta or Maryland, where he’d feel more at home. But over the past decade, a new generation of educators with a deeper interest in diversity is starting to supersede its retiring, aging predecessors, Scott says. The complexity of the county is changing. You want teachers to represent the communities that we serve and the children that we serve. Likewise, Long Island’s population has significantly diversified over the past four decades. In 1980, Long Island was 89 percent white, according to a 2017 report from national research institute PolicyLink. The estimates are based on data from the U.S. Census Bureau and Woods & Poole Economics, Inc., an independent firm that specializes in demographic data projections. In 2010, that number had dropped to 69 percent. And the report forecasts that by 2050, the Latino population will surpass the white population by three percentage points. Long Island’s changing population already has sparked advertising and recruitment changes across the region. 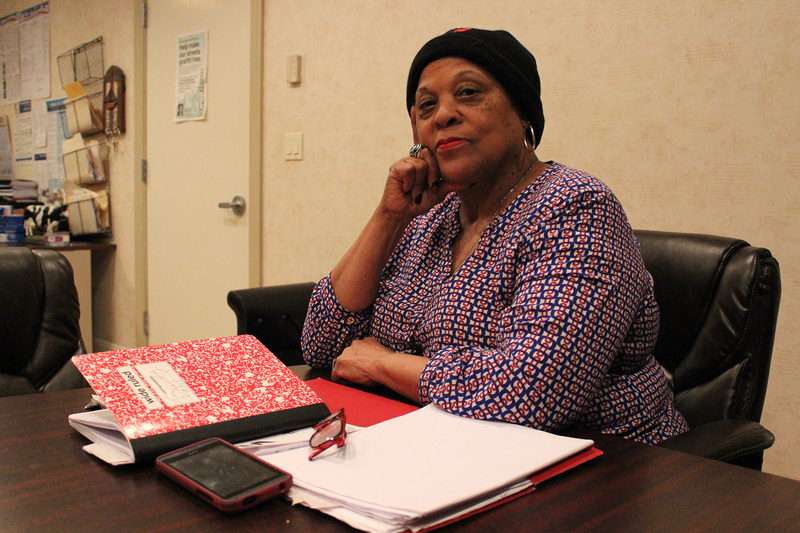 District representatives have sought qualified, diverse candidates through organizations like Long Island Black Educators Association and the Long Island Latino Teachers Association, said the organizations’ presidents. Districts like Patchogue-Medford have been posting open vacancies through The New York Times and social media, hoping to attract a more diverse pool of candidates. And groups like Nassau BOCES, which offers programs and services for 56 school districts, have been running diversity career fairs that help school districts recruit qualified candidates of color. Eastern Suffolk BOCES, which serves 51 school districts on Long Island, increased its recruitment efforts, as well. In 2017, Eastern Suffolk BOCES sent information about its fairs to 53 colleges and universities with teacher preparation programs, Terri McSweeney, the agency’s Assistant Superintendent for Human Resources, wrote in an email. In 2018, the group upped that number to 150. But it’s unclear if Long Island’s Latino teachers are scattered across school departments – the humanities, STEM, special education – or largely confined to classrooms that exploit their bilingualism. It’s also unclear if any districts are making significant headway. Midha says it will take a collective effort – starting from the top – to increase the number of educators of color on Long Island and in New York State. That includes schools, district school boards, educator preparation programs, the Board of Regents, the state education department, legislators and the governor. And, Scott adds, everyone else. Are you a teacher of color on Long Island? Share your own experience here.